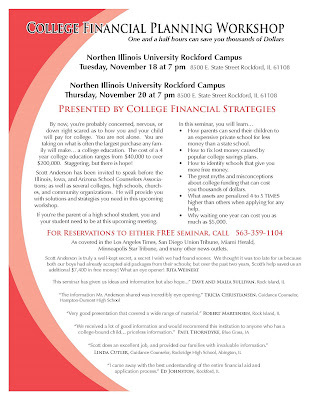 The Maximizing Money for College Workshop is upcoming in Rockford, and the Student Goals & Passions Workshop is upcoming in Davenport! 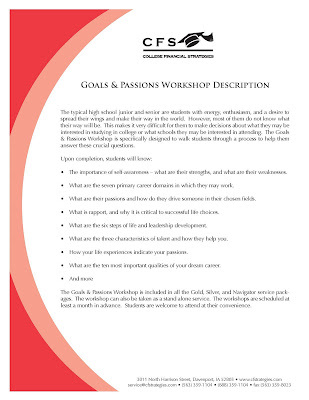 Our next Goals & Passions Workshop will be on Saturday, November 22nd in Davenport at the CFS Building at 3011 N Harrison Street. It will start at 10am and finish at 2:30pm. We'll order in pizza for lunch. Please call our office to make reservations before noon on Friday, November 21st. There is some great advice available for prospective college students available on the web. Here are two videos I thought were worth you and your student's time. The first video is advice from students for students. The second is... well... umm... be careful what you ask a Ninja.